I was never a runner, but I wanted to be. I attempted to join my elementary school’s cross-country team until my mom told me how BIG my legs would get and that put an end to it real quickly. Throughout the years, I’ve run here and there – whether through sports, or actual running (to a maximum of 5km). Well, I suppose it’s still considered running , but it just didn’t feel enough. Well, I think I can call myself a runner now. 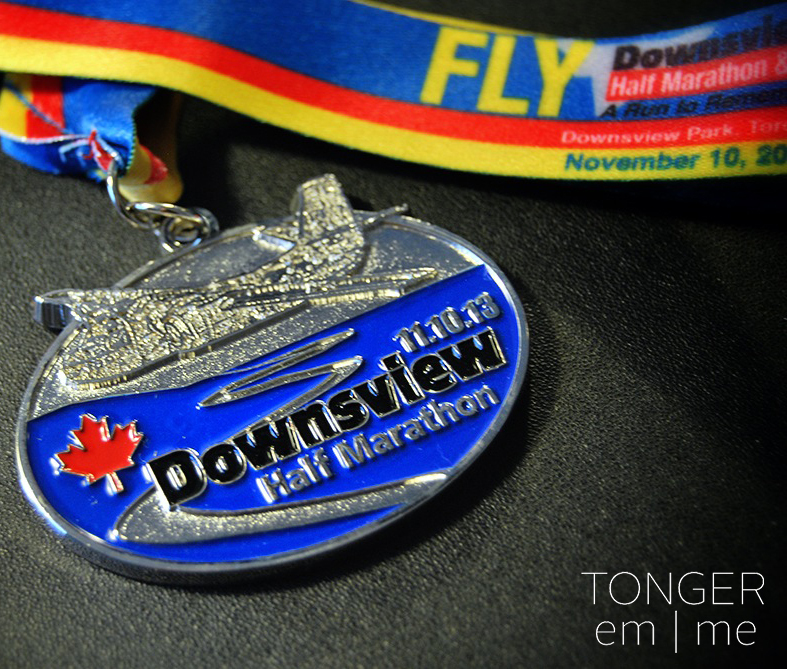 I just completed my first half marathon (Downsview) on Sunday with a time of 2 hours, 11 minutes, and 14 seconds. Training was difficult and time-consuming, but it was also enjoyable and rewarding. I pushed myself beyond what I thought were my limits, and am both surprised and proud of what my body had achieved. I spent a little less than 2 months to train, and didn’t keep to a strict schedule. The only consistency was running once to twice a week with my friend Mike – who was my motivator, pacer, trainer, and drill sergeant during these runs. When I woke up on race day, the nerves finally kicked in. I couldn’t really stomach anything (although I generally don’t eat anything pre-run), but knew I should. I forced down a small banana, a couple bites of my protein bar, and then I was off to the race site. It had been raining all weekend and race day was even worse with the raging, tornado-ish winds. I chose to wear my tight, black Lululemon pants and long sleeves top with a black headband that covered my ears, and my hot pink Nike Free running shoes. I was a ninja from head to …well, almost toe. I donned the neon-green race shirt because I wanted to feel like a part of the running wolf-pack (and because it was really cold). And to finish it off, snuggling inside a top-of-the-line garbage bag. Oh, I looked damn classy. The race horn blared and everyone sped off amidst the cheers and whistles of spectators braving the cold weather. The first 3km was AWFUL. I started to doubt myself on finishing the race. If this is already killing me, how am I suppose to finish the remaining 18km?! It was cold, windy, and wet, and the hills were ever so cruel. Finally, what I thought was forever, I found my perfect pace and cruised along the course with the other runners. I generally have a tendency of getting too aggressive and going recklessly fast, and race day was no different. I was running at a much faster pace compared to my training runs, but I suppose the excitement, adrenaline, and awesome running buddies (even with Mike’s constant reminder for me to slow down) pushed me enough that the race was over before I knew it. The moment I crossed the finish line, I was so giddy and happy. I SURVIVED. I FINISHED. I remained focused and achieved my GOAL. Publicly, my aim was just to finish my race. Secretly, I hoped to finish in less than 2 hours and 30 minutes (timed based on my training runs). In the end, I accomplished both and surpassed my expectations. Overall, I was very impressed by the whole event and had a great experience. I couldn’t believe how many people were out in the rain for hours to hand us water and gels, to direct traffic, and to cheer us on. The race organizers and volunteers did an awesome job. My only complaint? The brutal, merciless winds. I can’t wait for my next half marathon in the new year. I am now addicted. I can now call myself a runner. Mike here, I did rock the race. I guess you did too. I have to just say, I am incredibly motivating.